Although it may operate as one of Reach’s most behind-the-scenes departments, our Waiver Case Management Program is also the one expanding most quickly right now. It wasn’t much more than a year ago when Chelsea Spearman was hired as Reach’s first full-time Waiver Case Management Director in August 2017. Chelsea quickly brought on two staff members, and since then, the group has multiplied to a total of six full-time employees: Chelsea, two lead case managers, and three additional case managers. A main reason for our growth is the sheer need for services. While we have begun case management for some individuals who have had other contact with us in the past or who directly contact us through our website, a majority of the people we support are referred to us through Hennepin County. This is currently the only county we are working with, and their steady stream of overflow cases keeps us busy. However, Chelsea is quick to point out that Reach is committed to maintaining smaller caseloads—about 32-40 per case manager; some agencies can have 60-80 cases per case manager. This allows us to ensure a high quality of service, with personal visits to each supported individual multiple times per year. 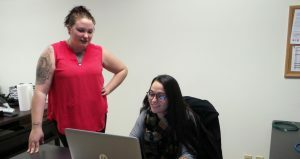 Chelsea (left) and Kinsey review options for one of the individuals they are currently supporting. As with any Reach program, this program is not strictly defined by numbers. “We’re here because we care and can make a big difference in someone’s life,” states Chelsea. The overall function of their group is to assist individuals in navigating the complex social services system and accessing appropriate resources. But Lead Case Manager Kinsey Brown explains that specific duties may include helping others find housing, obtain mental health or crisis services, locate work programs, or initiate in-home services or respite care…just to name a few. Clearly, case managers “wear a lot of hats,” advocating for others in various ways. For past newsletters, Chelsea has contributed articles that highlight some of these diverse roles, including Case Managers as Educators and Case Managers as Facilitators. She plans to resume this series in an upcoming newsletter, so watch for that. In recent months, the Waiver Case Management Department has been able to start offering a second type of case management: the Developmental Disabilities Waiver – Consumer Directed Community Supports (DD-CDCS). This is in addition to the regular DD waiver. Chelsea is hoping to gradually gain approval for offering even more types of waiver services and to begin working with more counties going forward, as long as excellent service is not compromised. This reflects the department’s most guiding value of providing person-centered, strengths-based, quality care.